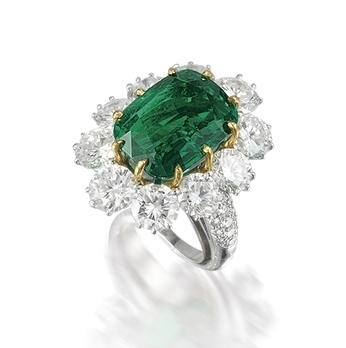 An important Colombian emerald and diamond cluster ring. Sold for HK$ 7,240,000 (€764,027). Photo Bonhams. 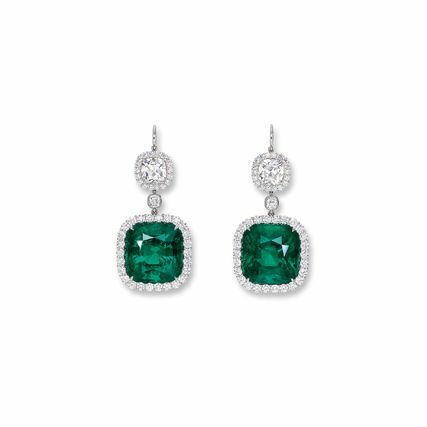 Accompanied by a SSEF report stating that the natural emerald has no indication of clarity enhancement and originates from Colombia. Report number 76360, dated 11 September 2014. 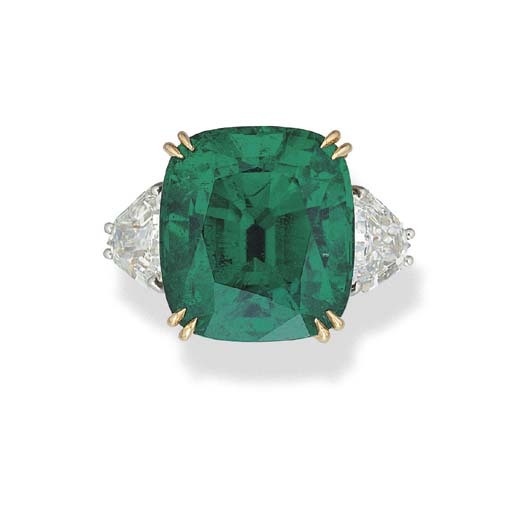 Accompanied by an AGL (American Gemological Laboratories) report stating that the natural emerald has no indication of clarity enhancement and originates from Colombia. Report number CS 83620, dated 6 June 2014. Each suspending a cushion-shaped emerald weighing 22.73 and 21.90 carats respectively, surmounted by a cushioned-shaped and old mine-cut diamond weighing 2.01 and 2.01 carats respectively, framed and linked by brilliant-cut diamonds altogether weighing approximately 4.25 carats, mounted in platinum. 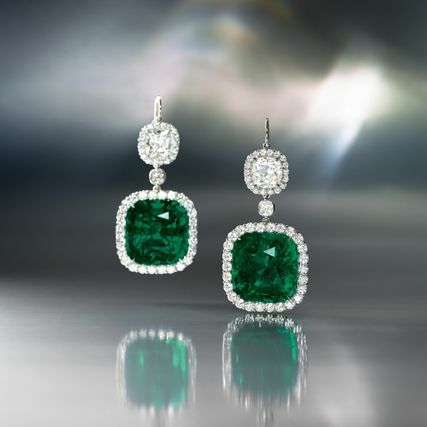 Accompanied by Gübelin reports numbered 1003731 and 1003779, dated 17 and 19 March 2010, stating that the 22.73 and 21.90 carat emeralds are natural, Green colour, of Colombian origin, with indications of minor clarity enhancement; GIA reports numbered 1112542307 and 2115515841, dated 13 January 2010 and 29 December 2009, stating that the 2.01 and 2.01 carat diamond are F colour, VS2 clarity. A ruby, emerald, opal and diamond butterfly brooch. Photo Bonhams. 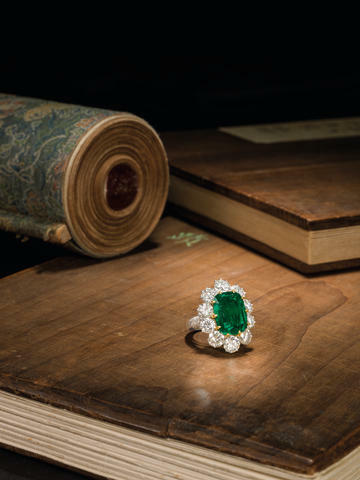 Accompanied by a certificate from Gübelin stating that the emerald is of Colombian origin, with indications of minor clarity enhancement. Certifiate number 11030022, dated 7 March 2011.